The amount of possibilities is enormous. That is why we decided to make a reference book and lexicon rather than a step by step manual. We are also preparing a project case youtube channel, that will no doubt be of great help. If you still get stuck or have questions, don’t hesitate to use the “feedback and support” button in the upper right corner of the UI. A ticket will be opened and we will help you out to the best of our abilities. As soon as you have installed our software, your desktop will show the icons of the programs you can use. If you purchased one or more licences with a dongle, you have a full use. With the free demo version, you can only run your show during one hour. This time limit is indicated in the bottom left corner of your screen. A limitation applies to i2f MediaConnector, i2f MediaBrick and i2f MediaController. i2f MediaEditor is freely available for an unlimited time. With the software, you have received a number of sample projects we have made. If you go through these first, you will get a quick overview of possibilities. 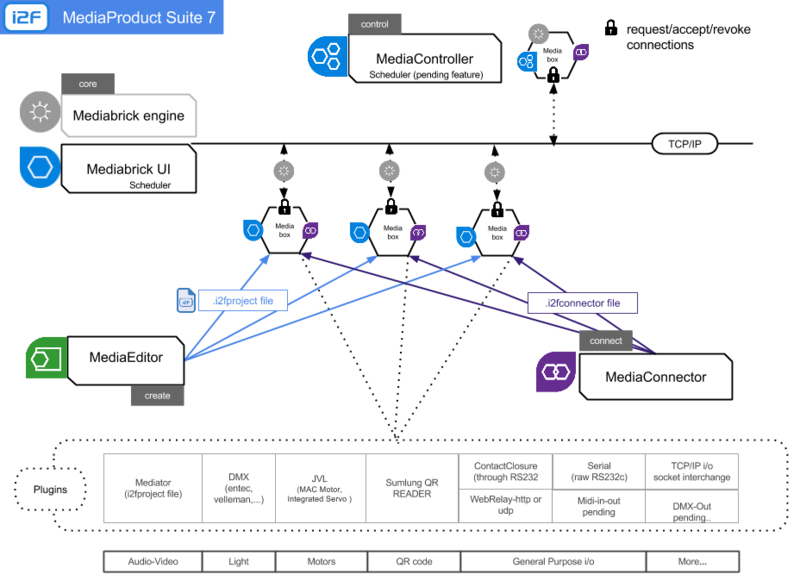 i2f MediaProduct Suite 7 enables communication between different “media", different “devices”, and “media” and “devices” mutually. Very complex relations involving content, software and hardware can be defined within this single software set. The software is written in C# and based on a 32 or 64bits Windows OS, a platform that makes it open to communication with a large array of other software and hardware. Moreover the strong growth in speed and capacity of this platform can only be beneficial to our software. Our software does not impose a sequential frame. Instead it offers a toolbox for creativity and imagination. The order in which you decide to use these tools is up to you. This will become clear when you advance in this document and of course, in exploring the software. Beside this open character, our software distinguishes itself by accuracy in as well the creative process as the functional flow, flawless switching, saving in manpower, saving in energy. Indeed, we aim at completely unmanned installations without the need of manual interventions. Automation for the benefit of an economical and rational use of energy and costly equipment! Whether these profiles are real persons or just a fictitious division of tasks performed by one person, we assume and advise that every project starts with a clear agreement on the overall purpose and the tools that will be used to achieve it. When the door is opened, I want a light to switch on. When the door is closed, I want the light to switch off. a light to switch on. and the door to close automatically. Content: i2f MediaEditor gets message “ the door has opened” an event is defined in the TRIGGER TAB of the .i2fproject (xml). This triggers a procedure/timeline with an mp4 file of the video clip. After the clip has finished, at the end of the procedure/timeline, MediaEditor sends message “show has finished” to the Mediator plug-in. setting the projectfile to inactive. sending a serial string to the projector or other display device to kill the video image lightsource. you as a user decide how simple or complex you make the scenario. Remember that a multitude of procedures / events / actions can be used concurrently. i2f MediaBox is an assembly of high quality components in a practical enclosure, offering a solid base for our software. A correct balance (load balancing) is a key element in reliability. i2f MediaBox focusses on multitasking, multicore & hyper threading technology. One box, multiple tasks, divergent tasks! Every MediaBox runs at least the MediaBrick program and can be controlled by a MediaController. Using our hardware is not a necessity but as a user of our software you may appreciate the R&D in hardware we have done over the past years. Every link in the chain is important to make a project successful! User interface for all functional aspects of a show: start/stop hardware and definition of procedures on a technical level. Consider this as your dashboard. You can have a licence standalone or in a network, with or without scheduler. Establishes a physical link between hardware and software and makes a project effectively work on an i2f MediaBox or other standard hardware. Only when working on your .i2f projectfile in i2f MediaEditor, you don’t need the MediaEngine. Otherwise it is the beating heart of your software. Without it, nothing will happen. the MediaEngine was previously called “ManagedServicesHost”, a name that still occurs at some locations, e.g. in the console screen. The list of potential connections is linked with the plug-ins we have created and will create in the future. See the chapter i2f MediaConnector for details on plug-ins. The MediaEngine is the instrument that basically carries out all tasks that are described further on in the documentation. It is a also a message broker. The MediaEngine enables communication between i2f MediaProducts and third party products. E.g. start up and display Google Earth, a PowerPoint presentation etc. More about “external applications” in the chapters i2f MediaEditor and i2f MediaConnector. The i2f MediaBrick software starts at system startup. 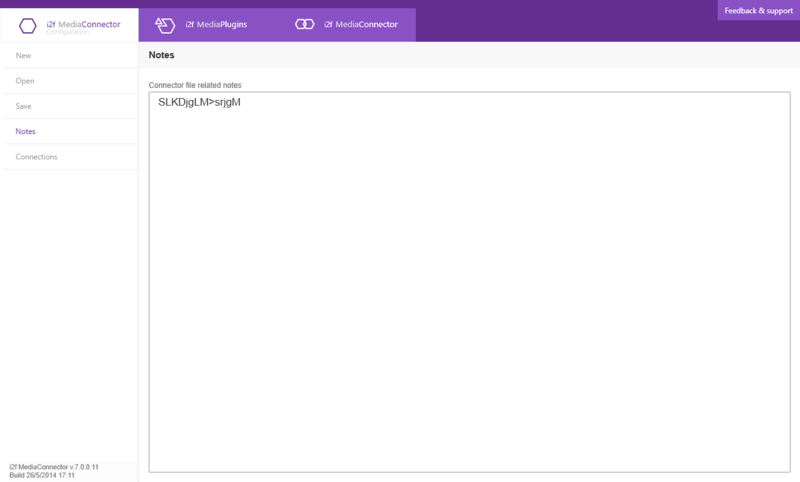 The core functionality of the MediaBrick is to run an .i2fproject file (created in the MediaEditor) or an .i2fconnector file (created in the MediaConnector). are made by the “creator-designer” role. These files make use of “resources” (content) and procedures. If nothing else is defined, the project follows the “main” procedure. The project file contains the definition of timelines, events and actions. A timeline can define an order in different content files, e.g. start splash screen, then video clip, then again splash screen. Events or triggers and actions can be entirely content related and thus function within the MediaEditor universe. E.g. start audio track x after the 25th frame of video clip y. Or: when a person touches a certain sensitive zone on a screen, show image x. The MediaBrick runs the timelines, registers events and responds to these events by executing actions. are made by the “technician-integrator” role. Procedures are determined here to establish links between the “self” hard- and software and diverse other devices or peripherals. The connector file contains the definition of events and actions. E.g. when button x is pushed in, send a message to the MediaBrick in order to perform action y. A whole series of consecutive instructions has been reduced to a few simple steps in our software. The MediaConnector allows you to give a friendly name to the event or trigger, e.g. “button is pushed in”. The action that will be taken can take place entirely in the MediaConnector universe, e.g. “then open the door”. In that case there is no need for a MediaEditor. Events and/or actions can involve plug-ins. Please find the details on the i2f MediaConnector functionalities in the specific chapter. What is important here is that the MediaBrick registers and runs the events and executes actions. If there is a connection between content and any “external” device or peripheral, a link (IF/THEN) will be established between the .i2fproject file and the .i2fconnector file by i2f MediaConnector. i2f MediaBrick will execute all tasks. An event can be followed by an action/multiple actions: e.g. “Activate or deactivate a device”. An action can be defined on timelines (i2f MediaEditor) or in the scheduler (i2f MediaBrick) or in i2f MediaConnector when it occurs on the level of a hardware device e.g. “open door”. Administration, meaning the administrator is doing something (checking, modifying, updating … the program). When no project file is loaded; the system is ready so administration tasks can be performed, both in the MediaBrick software and general operation system. Sleep, meaning a project file is loaded but not yet executed. The system is waiting for an event (such as motion detection, mouse movement, keyboard stroke or scheduled time). If you want to show something in this mode, that can be defined in the Splash settings. The project file is being executed. 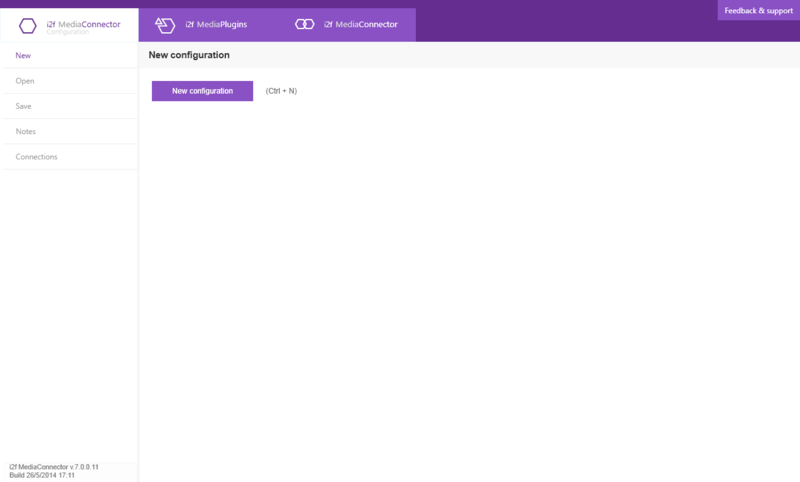 In the setup page, you define the ID-tag of your MediaBrick, connected to the identity of the local machine on which you have installed our software. With a standalone licence (MBRK), there is no need to establish a network connection with other devices or licences. With a licence “with network” (MNET), this setup information is crucial. Start with the network configuration of your machine or have that done by the network manager. If possible, choose a fixed IP address in order to have an overview of who’s who in your installation. Now give a unique name to your MediaBrick. Choose two consecutive IP or server ports, again if necessary with the assistance of the network manager. We normally use 3010 for the MediaEngine and 3011 for the MediaBrick UI. Define the default folder from which the .i2fproject and/or .i2fconnector files will be retrieved. In our example, we direct you to our Sample files. 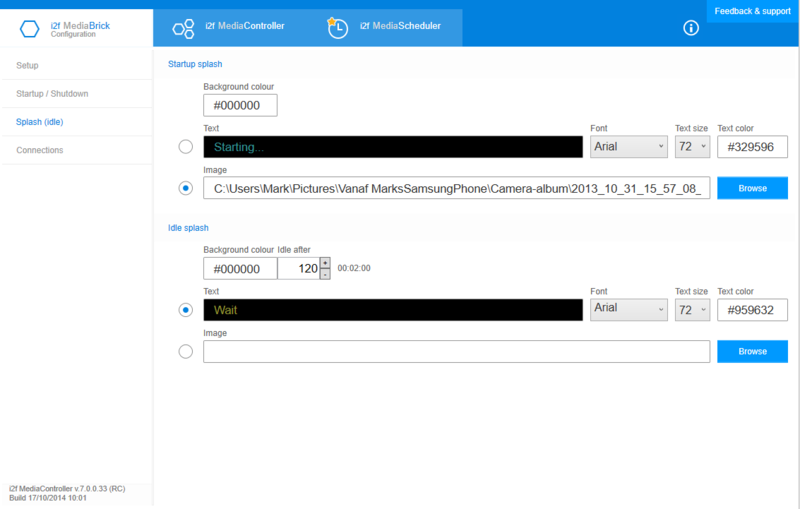 The show console switch allows you to monitor in real time activities that are managed by the MediaEngine. If you tick it, the console screen will open at each start-up or re-start of the MediaEngine. When you close this screen, you will go through a black screen. The tab i2f MediaScheduler only appears if you have a licence MSCH as opposed to MNSC (no scheduler). 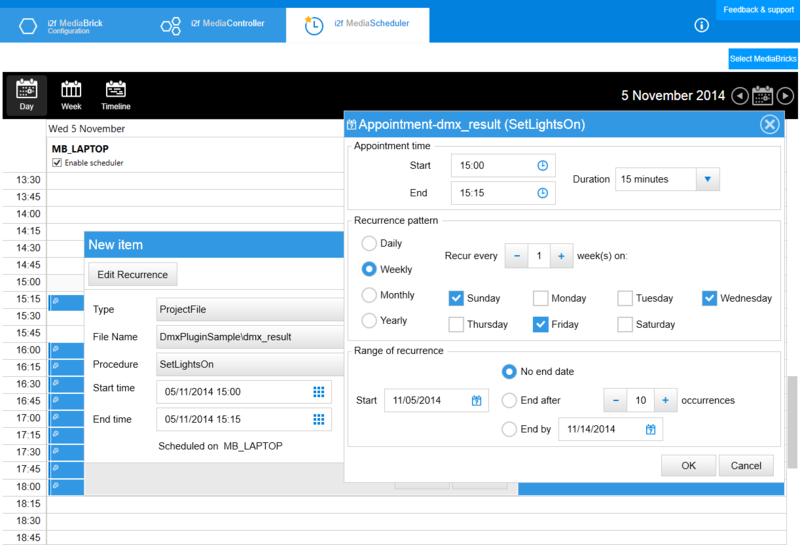 The scheduler function is a default element of i2f MediaController and can be used there to schedule your entire installation. Base pathDefine the default folder from which the .i2fproject and/or .i2fconnector files will be retrieved. In our example, we direct you to our Sample files. Show consoleThe show console switch allows you to monitor in real time activities that are managed by the MediaEngine. If you tick it, the console screen will open at each start-up or re-start of the MediaEngine. When you close this screen, you will go through a black screen. On this page you define what to start up and some additional definitions. Run RUN means you start this mode here and now. But it also means that your MediaBrick will immediately go to this mode at power ON or when a controller or scheduled event requests it! Running a desktop mode can be useful e.g. to modify additional software, configuration settings etc. or when this MediaBrick is your working instrument. In most cases the MediaBrick will operate as a media server and you want it to run a show or project without any disturbing intermediary (Windows) screens. In that case you tick “run Project file”. Select it from the list that you have made available through the Base path on the Setup screen. In that case it seems logic that you also suppress the Windows taskbar. If there is a Connector file involved, you can fill in a Connector delay. This can prove to be usefull in order to manage the start-up latencies of all devices in your installation. The third option is to run a Connector file, e.g. when this particular MediaBrick is meant for DMX control or other technical tasks. As this kind of tasks doesn’t interfere with the visual aspect of your desktop, it is perfectly feasible to run a Connector file and still use the same machine for other tasks. However do read the remark below! Shutdown each day at... allows you to protect your machine against a brutal power cut-off during activities. We use the 24 hours scheme. We strongly advise you to strip your hardware of all superfluous software, such as antivirus software, as your MediaBrick must be a dedicated piece of hardware. All prompts for updates and unwanted interruptions of your project need to be prevented. In general, load balancing is key. Keep a watchful eye at all times on the amount of tasks you can impose on your hardware simultaneously. Check out our Samples to find out what we have successfully tested. In the Splash (idle) page you define a splash screen that serves as a neutral, personal, corporate… image whilst the machine is in the process of starting up your Project file. It can be a background colour (hexadecimal format), text (font, size and colour) or an image that you retrieve by browsing. An Idle Splash is shown whenever the machine goes into idle mode, e.g. waiting for an event to come in. In that case you define a time lapse after the last action. Idle SplashAn Idle Splash is shown whenever the machine goes into idle mode, e.g. waiting for an event to come in. In that case you define a time lapse after the last action. This screen presents an overview of connected MediaBox/Bricks and/or MediaControllers. On this screen appear the MediaBricks/devices with which a connection is granted. This can only be the case if 1/ your MediaBrick is a network version and 2/ an i2f MediaConnector licence is applicable. Indeed there can’t be an exchange of data between different MediaBricks without a MediaConnector. If your installation involves an i2f MediaController, it is naturally understood that the connection initiative will be taken by the Controller in order to gain access to each individual MediaBrick in the chain. Each connection that was granted can also be revoked. This has to be done on the level of each local MediaBox/Brick. This tool is free and in ongoing development. We try to explain the basics of its almost unlimited features. Just remember that the use of i2f MediaEditor for your graphical work is not obligatory. You can start-up an external application made in any editing program. However, with a bit of practice, you may want to explore the possiblities offered in the MediaEditor to break out of the conventional canvas! i2f MediaEditor is meant to create an .i2fproject file (xml). Media resources (video clips, bitmaps, animations...) are the ingredients. Our software respects the native image quality and pixel relations of your source material. At all times you can reproduce your file 1:1, without squeezing or stretching the image. The software has no limits in the amount of pixels or in pixel animations that you can reproduce. However, hardware and video output are important. In order to provide the complete scope of formats, resolutions and animations on hardware level, we offer i2f MediaBox. Procedures are defined, such as making one or more playlists, play them once or in loop, start up a touch application with virtual sensitive zones... The Project is passed on to the MediaEngine. .i2ftemplate files with project models simplify the design process. Interactivity remains within the project file, e.g. a virtual push button as a trigger, can be done with i2f MediaEditor. If your show involves physical means, you will need to communicate with i2f MediaConnector. The definition “screens” in this context refers to a display zone. The number of screens reflects a physical relation with the number of video outlets you have available in your hardware. This example makes use of 4 DVI outputs on a standard Nvidea Geforce 650 GTX video card. Each screen has a 1440*900 pixel aspect ratio . It can be placed in any rotation and can have common pixel zones. Together in this example, three screens constitute a total canvas of 3500 by 2800 pixels. List of available content which can be animated as a resource on the defined screens. Area: are user defined pixel zones which can be used to start different triggers. External Program: third party applications , e.g. Google Earth, Excel, notepad etc. Template project file: small project files e.g. small button animations which can be reused in the scope of a general project. In summary, there is virtually no limit to the content the software is capable of using. You will be confronted with limitations in the hardware/ video chip, user rights, codecs... Proven to work: e.g. 9 simultaneous dynamic web pages on top of a high definition video clip. Jittering image or a smooth build-up and animation? That is all a matter of testing and subject to your better judgment. 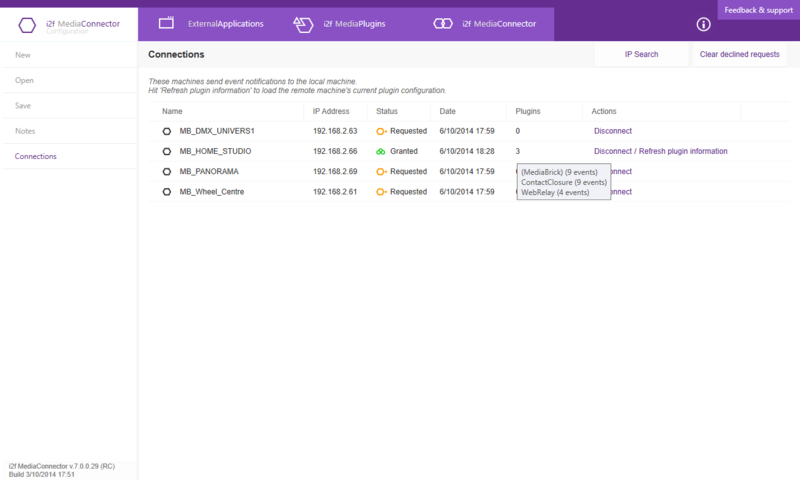 i2f MediaConnector UI is the tool you use to configure all relations between hardware and software. The work is saved in a .i2fconnector file. "Friendly names" translate complex formulas or processes for the benefit of the graphic artist or creative designer, e.g. a hexadecimal string becomes "push button in". A preview /listen modus helps to test the plug-ins. 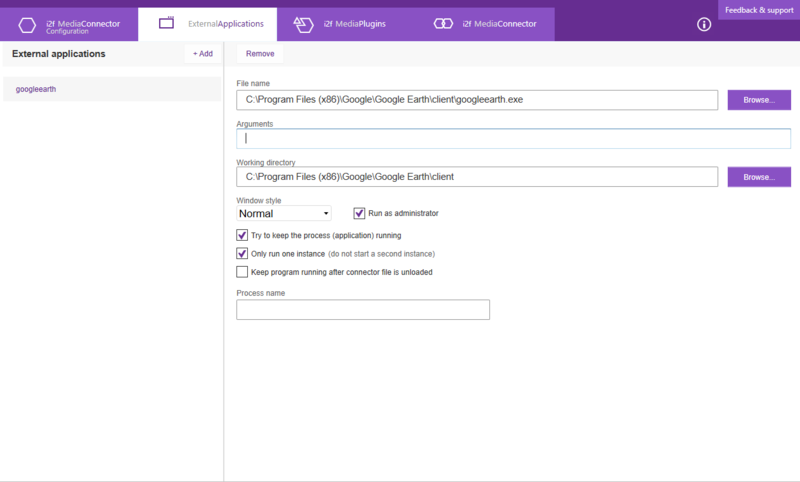 Via the Webinterchange plug-in, "external applications" such as Excel, PowerPoint, Google Earth... can connect with the MediaEngine. The MediaConnector UI allows you to define, modify, supervise and schedule all relations between diverse plug-ins definitions and the MediaBrick. 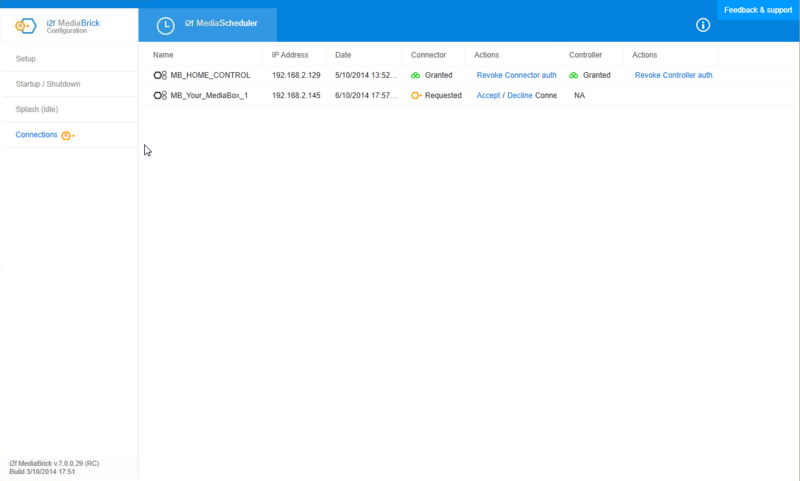 i2f MediaConnector connects multiple i2f MediaBricks in a network. Communication between MediaBricks takes place with mutual authorisation (security). As the name indicates, i2f MediaConnector is the link between the different components of a Project. 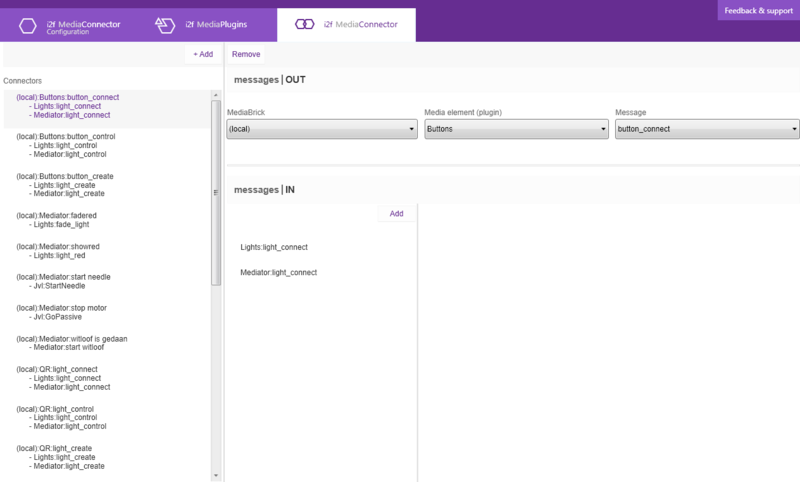 In the earlier mentioned example case, all events and actions are defined in the MediaConnector and communicated to the MediaEditor (creative role), the MediaBrick with MediaEngine (the engine that has to execute them) and - if available - the MediaController in order to have the overview. New configuration (Ctrl + N) Start creating a new xml .i2fconnector file and give it a name. Open .i2fconnector file (Ctrl + O) Browse through the files that you made available on the MediaBrick setup screen, in the Base path, and open an existing .i2fconnector file. We show recent files and make them available. 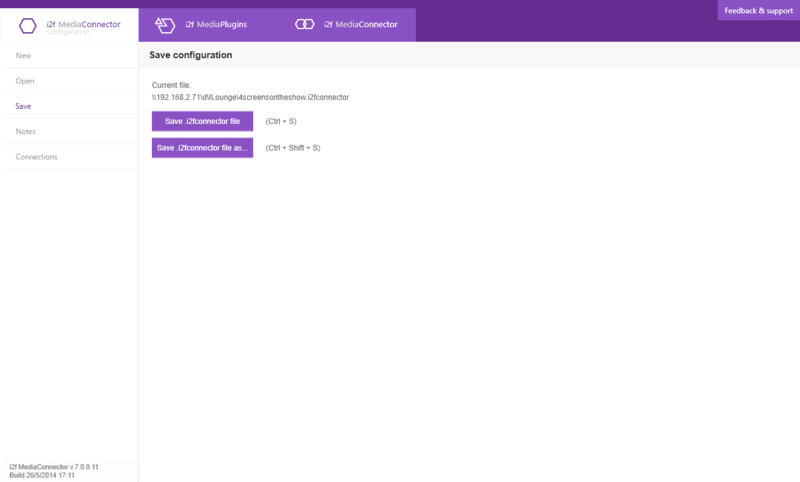 Define the location on your MediaBox or other device where you save your .i2fconnector file. Connector file related notes Type in any information you want to save for future use or share with other users. E.g. the type of push buttons you use. IP search In order to establish a connection with one or more other MediaBoxes/Bricks, you can do an IP search. See also: i2f MediaBrick/configuration/connections. Clear declined requests As a request for connection can be declined or revoked, we find it useful to be able to clear all declined requests. External applications are applications made with the help of “third party programs” or literally provided by third parties. All you can do with such an application in the MediaProductSuite 7 is start and stop it “as is”. In fact our software “doubleclicks” for you on the appropriate icon to start up the application and “clicks on the cross” to close it. It is your responsibility to decide what you introduce as an external application and if you trust its source. This is one of the standard plug-ins that come with i2f MediaConnector. We use the widely available COM port as an input detection. You can attach a number of USB-RS-232 converters to the MediaBox/Brick to increase your inputs. If a greater number of inputs is required, we suggest you use one Pokeys plug-in (52 inputs). Select this plug-in from the drivers list and give it a name. What it does is using a standard serial port as a ContactClosure input. The JVL plug-in is used to communicate with integrated servo motors and stepper motors. By altering and testing position, velocity and acceleration, different effects can be stored. Each preset name can be previewed by clicking on the preset name and clicking on the small preview arrow which appears to the right of the preset name. You can gradually switch on levels of channels which are stored in presets, using the faders. The pages can contain a different grouping of channel numbers organized as you see fit. Each preset can be previewed through use of the small arrow to the right of the preset name. If a preset is obsolete, you can delete it using the cross. 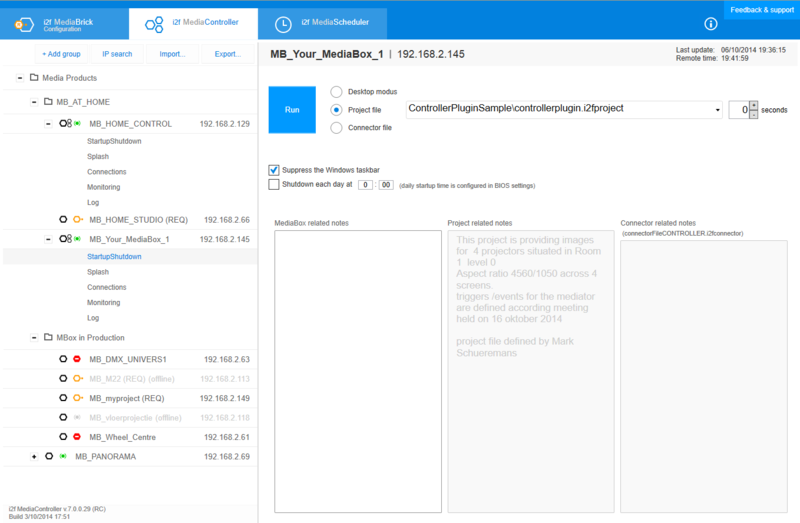 The Mediator plugin is the bridge between your Connectorfile and Projectfile (MediaEditor) through the MediaEngine. It is a standard plug-in within i2f MediaConnector. The configuration comes down to a list of “friendly names” that are exchanged from and to the Projectfile as defined in the MediaEditor. The QR_reader plugin consists of a camera and led light neatly integrated in a small form factor box. It reads 2 D code and transfers it at a rate up to 30 scans a second to the connector with a “friendly name”. For reasons of convenience, currently we make use of a Sumlung QR reader. This tool consists of a camera and led light neatly integrated in a small form factor box. For novice users, e.g. in a museum, this box optimizes the process from “presenting the 2D code” to “scanning & output”. Polling Interval & message delay: Use the listen button to learn the QR code whilst placing the code on the Sumlung scanner. Up to 30 scans a second can be transferred. Determine if you require an interim delay. The webinterchange plug-in is a link between standard XML code and a “friendly name” in your connector. Portverify the best available port to send through your XML code Listen: allows you to grab a large html string and convert it automatically to a friendly named event. Listenallows you to grab a large html string and convert it automatically to a friendly named event. This final tab in our MediaConnector user interface is for the definition of relations between plug-ins.. Two types of relations can be defined: Ordered or Unordered. In our examples on page 3, this is the third step where you say “IF the door opens THEN say lights on”. Ordered conditions are a combination of events that need to happen 1/ in an exact order and 2/ all of them, before one or more actions take effect. Unordered conditionsare one event or a combination of events that happen in random order, either one or all of them, before one or more actions take effect. a combination of events of which “any one” will do to have an effect, is at this stage not a sufficient condition. i2f MediaController facilitates the remote management of a number of MediaBox-MediaBricks, a feature to be valued especially when physical access is difficult or when you cannot disturb the normal operation. Programmed start-up and shutdown procedures, time schedules and motions sensors can be used to establish a totally unmanned installation that is active when it is relevant. A MediaController gives an overview of the status and configuration of all the MediaBoxes which are present on a site. The MediaController can discover the MediaBoxes it manages by communicating with them on TCP/IP port 2000. The payload is transferred in XML format. The MediaController can request to be informed of the status of one or more MediaBoxes. The MediaController can switch MediaBoxes on or off or request a reboot. 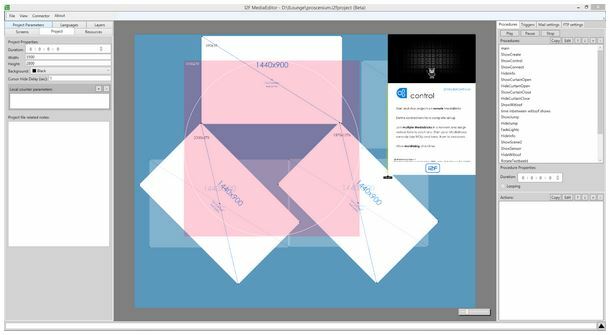 A standard set-up would involve one MediaBox per site/project, which primarily runs MediaController software and monitors different MediaBoxes:devices with MediaProductSuite 7 software. 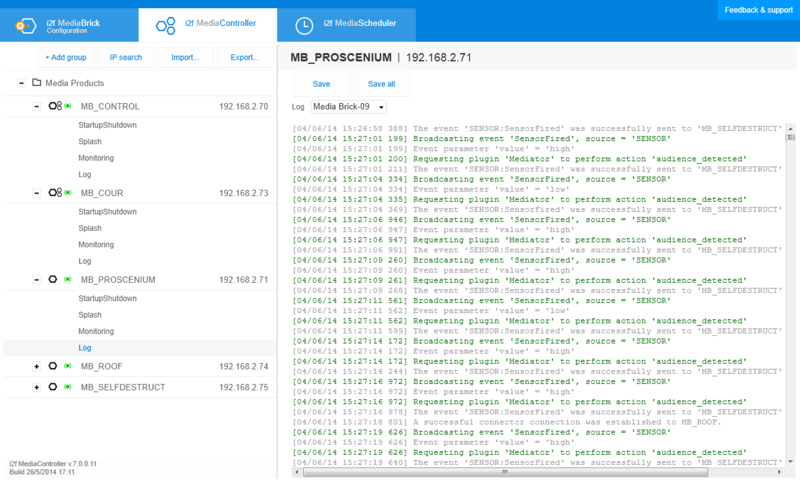 See MediaBrick for information about the MediaBrick configuration tab. 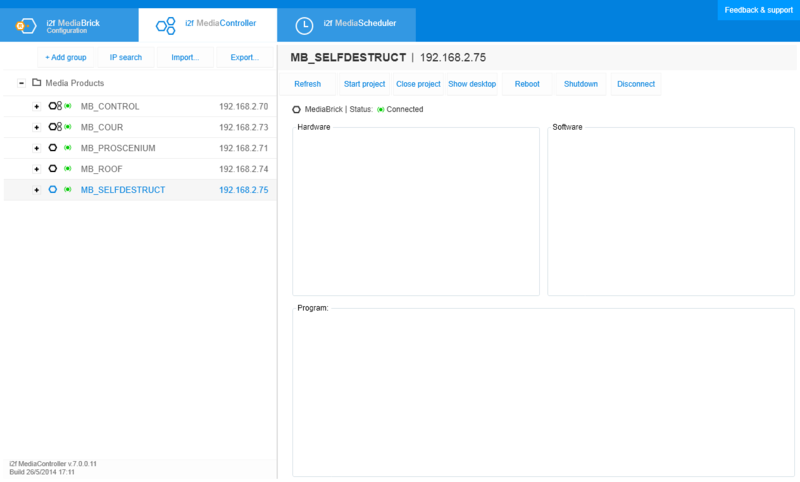 The MediaController page begins with an overview of the MediaBoxes/Bricks in your network. +Add groupAllows for grouping MediaBox/Bricks in order to control them collectively. Suffice to click, drag & drop a MB in a group folder. IP searchmakes the discovery of MediaBricks on your network possible. Assign the MediaBox/Bricks to your controller list by highlighting them. Import...loads a preview list of MediaBox/Bricks found in a previous search. 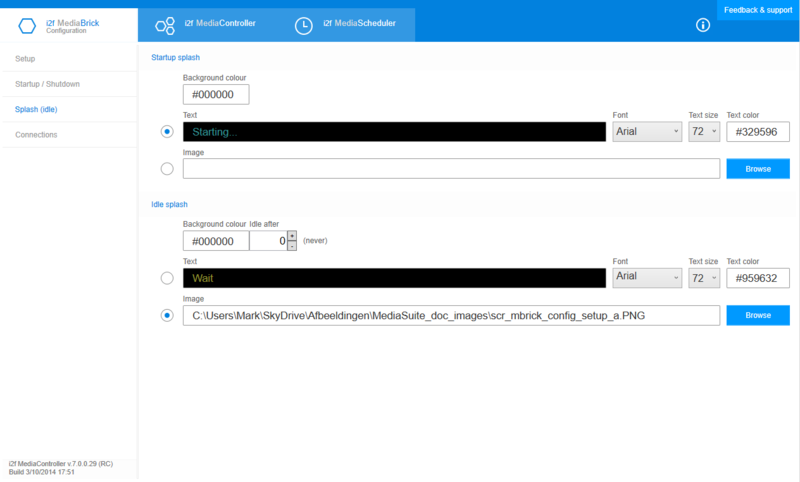 This allows the user to reuse previously found Mediaboxes/Bricks and gives him/her the option to do a Wake On Lan. Export...Saves the current list of MediaBox/Bricks in your list. A selected MediaBox displays the basic control features and shows a quick overview of the hard & software specs, albeit not meant to be complete at this stage. This tab/page allows for the definition of text or images which are shown whilst the MediaBrick Engine is either loading a project or not showing /doing anything (idle). For any of these phases the user can define a text e.g. loading a corporate image. Shows a real-time input and output scope of animations,events,actions and the status of the selected MediaBrick. The aforementioned can be de-selected to facilitate the ease of use when focusing on one specific element. The Scheduler page, as the name suggests, allows for scheduling events in a time frame , e.g. start projects/connector/Wake On Lan or shutdown Media Boxes/Bricks. The schedule is based on a year/month/day calendar and an hour/minute format. A convenient recurrence pattern turns the planning of tasks into a breeze. Output trigger, see i2f MediaBrick chapter. A standard plug-in available in i2f MediaConnector. The hardware used in a project including peripheral apparatus. i2f MediaBox is a dedicated device for the use of the i2f MediaProductSuite. Optional plug-in in i2f MediaConnector. At this moment we only offer DMX out, with two available drivers: Velleman VM116 or K8062. Input trigger, see i2f MediaBrick chapter. A dedicated device for the use of the i2f MediaProductSuite. File containing the description of connections between diverse hardware & software, plug-ins etc., made in i2f MediaConnector. 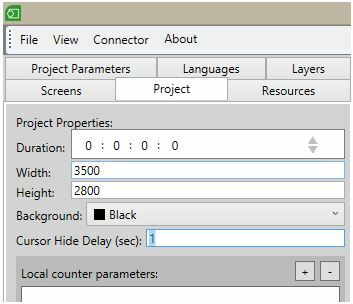 File containing the description of a Project with procedures, made in i2f MediaEditor. A MediaBox/Brick that is ready but not doing anything, e.g. waiting for an event. See also: splash. JVL_motor plug-in, optional plug-in in i2f MediaConnector. A standard plug-in available in i2f MediaConnector, bridge between .i2fconnector file and .i2fproject file, see i2f MediaConnector chapter. 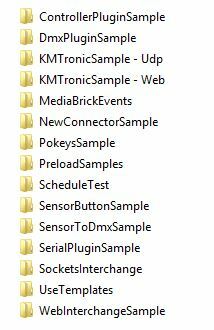 A standard feature of i2f MediaController, used to check the status and performance of multiple MediaBoxes/Bricks. The fact that events have to take place 1/ all of them and 2/ in a specific order before one or more actions are performed. See i2f MediaConnector chapter. A sometimes complex combination of tasks to be performed, defined in i2f MediaEditor. Basically it is what you can see, hear etc. A procedure is arranged as a timeline with media resources but also actions, e.g. a clip to be played, a spotlight to switch on, a sound to play, a touch zone to be triggered… One application/show can contain multiple procedures that can be performed simultaneously. Optional plug-in in i2f MediaConnector. Media (audio, video…) used in a project. A sample is an application or show that we programmed and tested. A message that conveys information from the MediaConnector to the MediaEditor. Afeature for programming actions using a timeline. It is standard available in i2f MediaController and optional with i2f MediaBrick. We use the term screen to indicate: 1/ user interface or 2/ a (virtual) display zone or “canvas” (see i2f MediaEditor chapter). 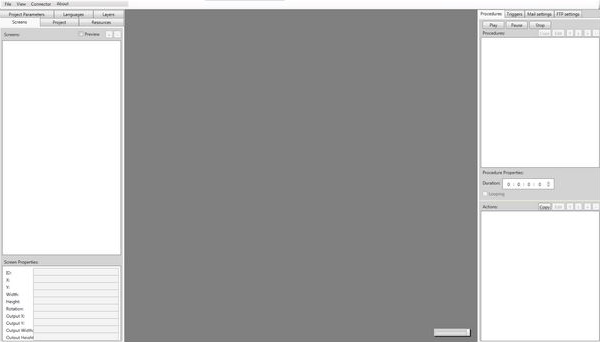 Screen that is shown when idle, either at loading the program, either waiting for an event. See also: idle. Chronological order in which a procedure has to be executed. Event (input trigger) or action (output trigger). The fact that one event or multiple events take place, all of them but in a random order, before one or more actions are performed. See i2f MediaConnector chapter. The creators sincerely hope that you will enjoy the use of their software suite and that you will share your enthusiasm with other potential users! Please remember that even a fantastic car can crash into a wall if you don’t have a driver’s licence or if you don’t watch out for obstacles. If you embark on an audiovisual or multimedia project, we suppose you have experience with content (video formats, pixel relations, codecs etc.). We also assume that you acknowledge the importance of cabling and a reliable network if you intend to link diverse MediaBricks and/or use i2f MediaController. If you install i2f MediaProduct Suite v.7 on hardware of your choice, make sure you uninstall all software that may create conflicts in priorities. All obligations of i2f are effort obligations. Except in the case of willful misconduct, i2f may not be held liable for any error, misconduct or negligence on the part of it or its employees or agents (hereafter Appointees), in the performance of the agreement. In no event, i2f may be held liable for any consequential damages, such as loss of data, loss of expected profit, reduced sales, increased operating expenses, loss of clients or damage to equipment or data that the Client, customers or users might suffer due to any error or negligence on the part of i2f or an Appointee. The total liability of i2f shall never exceed the license fee paid by the Client to i2f specified in article 5 of these License Terms, or 500 EUR, whichever amount is lower. If i2f turns to external suppliers, i2f does not accept any liability above or besides the liability accepted by those external suppliers for their products or services. The Software is provided to the Client “as is”. I2f can in no way be held liable for malfunctioning or temporary or permanent unavailability of the Software and/or Hardware or for any damages resulting thereof. I2f will make reasonable efforts in order to prevent that the Software would contain faults, bugs, computer viruses and/or malware. This is an effort obligation, and not a result obligation. I2f cannot be held liable for faults, bugs, computer viruses and/or malware, which the Software would contain despite its efforts. I2f is not liable for defects in the Hardware and/or the Software attributable to inadequate or incorrect use or implementation by the Client or third parties. I2f does not accept any liability for damages resulting from the use of software or hardware by the Client that is not supplied by i2f, incorrect actions or non-compliance with legislation or with the instructions given by i2f, or from maintenance or support services not supplied by i2f. In case the Client consults i2f for analysis and/or reparation in such cases, i2f’s intervention will be charged to the Client at its hourly rates specified in the specific conditions set out in the order form To the best of i2f’s knowledge, the Software does not infringe the Intellectual Property rights of third parties. In case a third party would pretend that the Software does infringe its rights, or if a third party would initiate legal proceedings against i2f or the Client on the basis of an alleged infringement of its Intellectual Property Rights, i2f has the right to decide in a discretionary manner to: (i) invalidate those allegations or claims, (ii) adapt the Software so that it no longer infringes the rights of that third party, or (iii) withdraw the Software from the Client against repayment of the license fee (pro rata of the use rendered impossible in a given license period). The Client has no right to claim additional damages from i2f. I2f reserves the right to adapt, change or complete the Software without giving prior notice to the Client.